We’re hugely proud to announce that the inspirational Row4Victory team have successfully completed their epic row across the Atlantic Ocean. They rowed into safe harbour after just 39 days, 16 hours and 42 minutes. To put it into perspective… more people have been to space and climbed Everest than have rowed across the Atlantic! 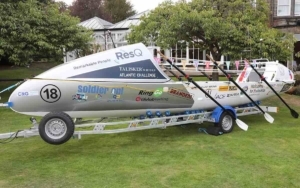 RingGo got involved in Row4Victory back in 2017 when we signed up to be one of the sponsors for the race, and we are immensely proud to have played a tiny part in their success. Row4Victory were raising money for the Royal British Legion and Soldier On – a charity recruitment organisation whose purpose it to secure civilian employment opportunities for service leavers and former members of the Armed Forces who have acquired a disability, life-changing sickness or long-term injury whilst serving. You can still donate to their chosen charities here.